Repair My Flute: Buying at a Show? 6) Puts the flute back together and does a "play in"
Because the flute has been travelling to and from the event, Rachel says she just wants to make sure that everything is okay. She said that purchasing a flute that has been on display is actually a good thing, because the flute is really stable and really "settled in" from being played at the show. She also said that because every flute is handmade, they each have a slightly different character and personality. So a brand new one -- even if it is the same model -- may vary slightly from the one you tried at the show. That being said, Rachel advises that "if you fall in love with one particular flute at the show, you should get it." 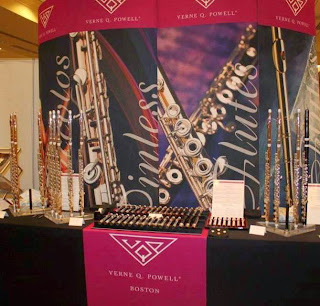 If you are trying flutes at a show just to get an idea and are open to a new model of the one you tried, you can always order a new one to purchase. You can also request a trial online on our website at https://powellflutes.com/schedule-trial. Time for a COA or Overhaul? Follow Verne Q.Powell Flutes, Inc.'s board Verne Q. Powell Flutes, Inc. on Pinterest.